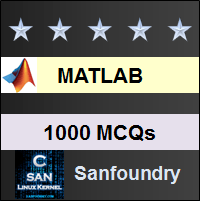 This set of MATLAB Multiple Choice Questions & Answers (MCQs) focuses on “Presenting Results”. 1. How would you plot multiple graphs in MATLAB? Explanation: The hold command is a pre-defined function in MATLAB. It allows the control to remain in the window where which was generated by MATLAB, the first time we type a command to plot any kind of graph. Then on we can plot multiple graphs on the same window. 2. How do you show the program of an MAT file? Explanation: MEX files are not M-files. They are binary files which store the values of variables present in the workspace. So there is no question of showing the program of a MAT file. 3. The help command works only for a pre-defined function in MATLAB. Explanation: The help command will only show the nature of functions of any command which is already existing in the MATLAB directory. If we want to show the purpose of our written function, we have to add comments in our m-file and then enter the echo command. 4. What is the equivalent of subplot (1, 1, 1)? Explanation: While using subplot (1,1,1), we have allocated memory as a 2-D matrix for only 1 graph. This is similar to the axes command which generates an empty graph. This is pre-defined in MATLAB. 5. It is not possible to store graphs as MAT-file. Explanation: MAT files save data from the workspace. A graph, plotted among different variables, cannot be stored in MATLAB since MAT-files are files used to store values from the workspace. Explanation: The load function is pre-defined in MATLAB. It is used to load variables and/or data from the disk to the workspace. Explanation: The short e format is used to represent a result with 5 digits and an exponent term. Now, this is pre-defined in MATLAB. Short g and short exp are not present in MATLAB. We cannot use a representation of 4 digits and an exponent as it is not defined in MATLAB, as of yet. 8. Which operator is used to prevent the printing of insignificant zeros? Explanation: %g is used to represent any number, which has a fixed number of digits or a number with an exponent, with no insignificant zeros. This is present in the MATLAB directory only. Explanation: There is no command called semilog or log to plot a graph with logarithmic scales. However, we have the loglog function, pre-defined in MATLAB, which allows us to plot a graph of two variables where both the variables are scaled logarithmically. 10. We cannot plot a discrete and continuous relationship in the same graph. Explanation: We can plot a discrete and continuous relationship in the same graph. We have to use the hold command and change the scaling of the variables a bit if at all needed, so that the discrete and continuous relationship looks prominent enough in the same graph. We have to use the hold command efficiently.